Fighting Fantasy — The Introductory Role-playing Game is a multi-player role-playing gamebook written by Steve Jackson, illustrated by Duncan Smith and originally published in 1984 by Puffin Books. It was not part of the main Fighting Fantasy gamebook series, but rather one of the many spin-offs. As a role-playing gamebook, it is most closely associated with the book The Riddling Reaver in that it is an attempt to extend the Fighting Fantasy concept into a more developed role-playing system, in a basic form. As such, it is an unnumbered addition to the Puffin series (ISBN 0-14-031709-0), often grouped with The Riddling Reaver in book listings. There are currently no announced plans to republish this book as part of the Wizard series. “ Fighting Fantasy — the bestselling phenomenon of our time! Thrilling adventures of sword and sorcery come to life in the Fighting Fantasy Gamebooks, where the reader is the hero, dicing with death and demons in serach of villain, treasure or freedom. Fighting Fantasy is essentially a step towards the already established role-playing universe as seen in games such as Dungeons & Dragons, moving readers gradually away from the single-player Fighting Fantasy gamebooks and towards the multi-player adventures of the other game systems. 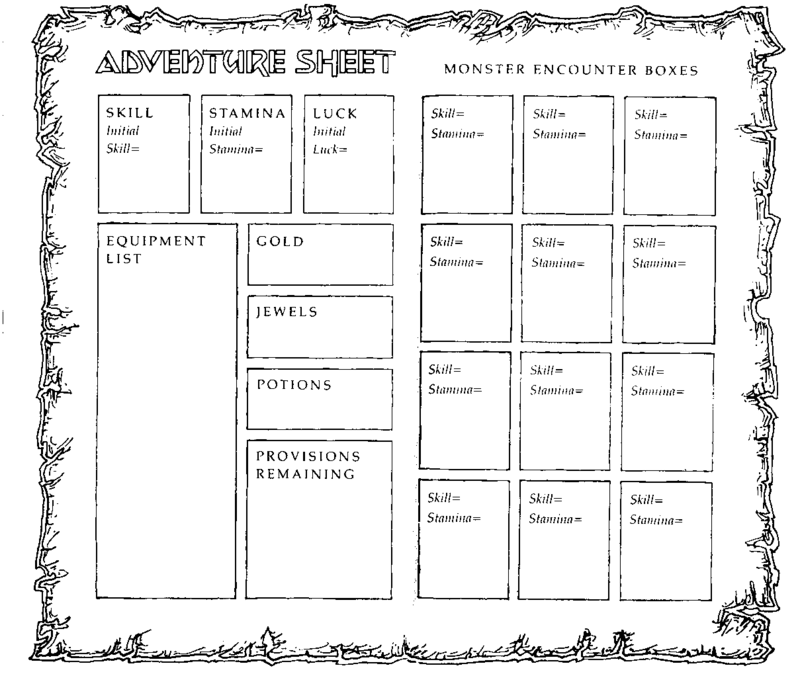 To this end the book uses the established systems of the books, but allows for more than one player and the ability to sidestep the prescribed two or three choices per reference of the gamebooks. Pages 22-29 illustrate just how the multi-player dynamic is meant to work with a short script of three players and a GamesMaster as they play the beginning of The Wishing Well. The book in general follows the original rules set down in The Warlock of Firetop Mountain (see Game System). Beyond the standard background material dealt with in a regular Fighting Fantasy gamebook, the book also provides instruction on dealing with the following concepts: Bribery, Carrying Equipment, Doors, Escaping, Falling, Losing a Weapon, Movement, Opening Chests, Picking Pockets, Returning to Areas, Searching, Sight, Time, Tiptoeing and Moving Silently, Wandering Monsters, and Wasting Time. Like The Warlock of Firetop Mountain the potion contains two doses. The original cover of the book was designed and illustrated by Duncan Smith. There was no edition with the Adventure Gamebooks banner. Unusually, the cover art was reversed when the book was reprinted with the Dragon Cover Format in 1987. The interior illustrations were by Duncan Smith. Unlike the regular gamebooks, due to the small number of references each paragraph receives an illustration to match. There were 58 full page illustrations and 5 minor repeated illustrations scattered throughout the text. There were also two black and white maps by Duncan Smith. In Warlock Issue 5, pages 6-7 and 26-27, there is In Search of the Mungies' Gold (boardgame), an adventure by Steve Jackson (UK) that is part boardgame, part roleplay game to be played with the rules of Fighting Fantasy - The Introductory Role-playing Game, with some minor adaptation. It is one of the few official adventures for this ruleset.